Answer for $200: What is the date and time of the leap into BASE jumping history? Answer for $400: What object did the 1966 jump take place from? Answer for $600: Which founding father of modern BASE was inspired to follow up with a first BASE jump of his own from the same object? Answer for $800: What is a skydiving rig with round parachute? 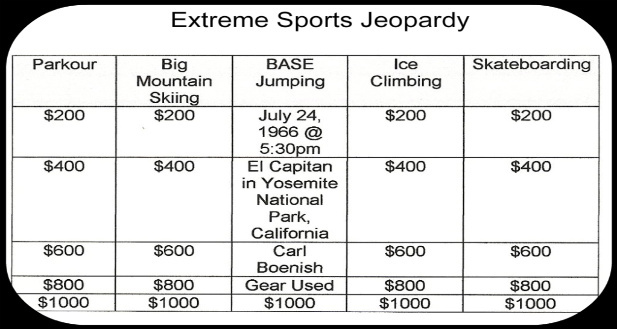 Answer for $1000: What are the names of the two men that made the historic 1966 jump? The answer is: Brian Schubert and Michael Pelkey. In researching B.A.S.E. history, you’ll come across the story of an El Capitan jump circa 1966 and the events that transpired 40 years later with the passing of Brian Schubert at Bridge Day. If you are a regular on the forum you might run across a post by Mike, usually he comments in reply to a friend’s post here and there. Or in reading through the articles section you’ll come across his telling of “the jump”. If Carl and Jean Boenish, Phil Smith, Phil Mayfield, Harrison Brothers, and their European counterparts are considered “Old School”, Mike and Brian are classified in an era of their own. They didn’t pioneer B.A.S.E., or lay claim to founding the sport, but what they did was set off a spark with their fortitude. No doubt like many others before them, including the designers of the parachute itself, the idea of jumping from a fixed object was given birth to as a lark. Twelve years prior to Boenish’s jump from El Capitan and the formation of modern B.A.S.E. jumping, Schubert and Pelkey had already made their leap into history. In today’s world of B.A.S.E. jumping with forum members dictating their versions of “ethics”, “rules” and “what’s an acceptable way to enter B.A.S.E jumping”, to manufacturers of high end gear and First Jump Courses; Schubert and Pelkey’s jump illustrates the “why not?” of a B.A.S.E. jump, instead of the “do not’s”. 1. Why did you feel compelled to jump from El Capitan? It was more of a lark than a compulsion. Skydiving was a relatively new sport and the El Capitan was obviously jumpable, straight down 3,200 feet off the valley floor. If we hadn’t got to it first, someone else inevitably would have. I can tell you the “why” of it quite easily. We were two like-minded, somewhat adventurous 26-year-old sport parachutists who wanted to do something that hadn’t been done before. The El Capitan was there and it had never been jumped. A co-worker of mine at Goldstone DSIF came up with the idea. When I mentioned it to Brian he was all for it. We did consider the Royal Gorge Bridge in Colorado as an alternative, but chose the El Capitan first because it seemed like a more adventurous jump. As for the “how” part, our plans were a little better than the implementation. Our girlfriends were supposed to film the descent from the bottom and a friend, Jim Cleary, hiked to the top with us to take still pictures of our exits. None of us had any idea how long the trip to the top would take and the girls gave up and left their posts after patiently waiting for some number of hours. The hike to the top took us over eight hours, so we ended up without any movies or stills taken from the bottom. To top it off the stills taken of our exits turned out to be very poorly framed and angled. Our mementos of the jump turned out to be mostly unkind newspaper reports from all over the world heavily biased in favor of the NPS’s official viewpoint. 2. What was your parachuting experience up to that point when you made the jump? The El Capitan jump was my 183rd logged jump. 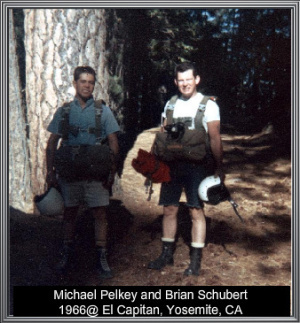 Brian and I both held Class C (Jumpmaster) licenses issued by the PCA (Parachute Club of America, since renamed USPA) at the time. I laugh when I see the definition of “modern” fixed object parachuting suggesting that tracking was a brand new invention. Imagine dropping off the top of a terminal object depending on luck to keep you from smashing into it on the way down. We knew how to track. 3. How did you determine the exit point, gear, flying & opening, landing area and timing of the jump? Gear was easy. The El Capitan was a “terminal” jump (I hate that term). We used our normal skydiving gear, including a 28′ TU unmodified round military parachute main canopy and a 24′ round chest pack reserve, along with everything we normally used for skydiving: helmets, goggles, sky gloves, jump suits, paratrooper boots, etc. Brian’s main may have been a 35′ T-10 with a TU mod. He was a big guy. The exit point was a matter of dumb luck. Lady Luck was on our side to find the sweetest exit point possible: an almost perfectly horizontal rock platform that overhung the wall by 8-10 feet. It happened to be the first possible exit point we came to at the end of the trail. I hate to say that we never discussed opening altitude or landing area. In retrospect we probably would have been able to make it over the trees and into the clearing if we had opened higher. Timing was also unplanned. When we got to the top, we geared up and jumped. We got a few books from the library and studied what we could from them. The only real useful information we could glean was that the El Capitan was a sheer vertical monolith that rose 3,200 feet above the valley floor. Other rather important details such as wind patterns, landing areas, etc., had to be experienced empirically. 5. In jumping rounds were you left at their mercy as you could not control your flight pattern; at what percentage did you calculate the risk of striking the cliff? Actually the rounds we used, modified in a TU configuration, were quite steerable and apparently had quite a bit more forward speed than commonly thought these days. The winds at the face of the mountain were the problem, not the equipment. They blew in every direction other than the most important one – out away from the face. The thought of striking the cliff never occurred to me until I began encountering the erratic updrafts and side drafts close to the face. I probably could have escaped injury if I hadn’t made the mistake of turning to face the wall so I could kick myself away when I hit it. Bear in mind that there was no knowledge base or study material on the hazards of cliff strikes in those days – 12 years before B.A.S.E. jumping began. I’ve heard that you can always recognize the pioneers by the arrows sticking out of their asses. 6. Did you discuss an emergency plan regarding injury or death? We were 26 years old at the time and thus invincible. Injury or death were the furthest things from our minds. Our only plan involved a celebratory bottle of champagne when we got back to our cabins. 7. How long after Brian was released from the hospital was it before the two of you were able to discuss the jump? It was quite a while, maybe two months. Brian’s dad was irate with us for having made the jump. His parents took him into their home and cared for him under the strict condition that he would have nothing to do with me as long as he was under their roof. I should mention that his mom didn’t particularly agree. She painted a beautiful picture of the El Capitan for a wedding present when my wife and I were married. 8. What effect did the jump have on you in your immediate life? Very little, other than the fact that my immediate supervisor at Goldstone DSIF was Dennis, Brian’s brother. That was the only job I was ever fired from in my life. The jump did give me some bragging rights at parties for a few weeks though. 9. Brian walked with a limp due to shattering his two feet in the jump; did you suffer any permanent effects from your broken ankle? Not at all. My injury was very slight. I resumed jumping less than a month later with a small ankle cast on my left foot. 10. At what point in your life did you realize the significance of your achievement? I considered it a personal conquest after it was all over. I took a moment to look up to the top after landing and thought: “El Capitan, you ain’t so bad”. After our fifteen minutes of fame (or infamy depending on the viewpoint), I essentially forgot about it for nearly forty years. In an effort to reunite Brian and me, Brian’s daughter Tina contacted me by letter a few months before the Bridge Day event in 2005. Brian had already been interviewed for Marah Strauch’s B.A.S.E. jumping film “Gravity”. Marah was trying to locate me for an interview and Tina pulled it together by sending a letter to every Pelkey she could find an address for. I met with Marah and Jean Boenish in Hollywood for my interview at that time. Someone suggested that we should meet some of the B.A.S.E. jumping community at DZ.com. Thanks to our meeting B.A.S.E. jumping’s noted historian, Nick Di Giovanni, on that site, we discovered that our El Capitan jump played a significant role in influencing Carl Boenish to begin B.A.S.E. jumping as a new sport. 11. Why didn’t you continue exploring the possibility of jumping from other objects? We had some very poor quality still pictures of our jumps from the El Capitan. Life Magazine processed the film with the intention of doing a piece on it. They decided against it once they saw the quality of the pictures, and agreed to pay all expenses for exclusive rights to a jump from the Royal Gorge Bridge. They backed out a couple of weeks before the agreed upon date to “make room for a piece on Miss America in Vietnam”. I assumed their real reason had more to do with possible legal issues of being involved with parachuting from the Royal Gorge than not having room for it in their magazine. Life’s backing out, along with being fired from my job and having been beaten to a bloody pulp by the press and almost everyone except most of the skydivers over the El Cap jump, it just went on my “to do” list of things I never got back to. I got married soon after and started a business. I did continue skydiving for a few more years but less frequently as time went on. 12. Were there any extenuating circumstances as to why you and Brian lost contact a year after the jump? Brian went off to the Police Academy and my wife and I went back to my home state, Michigan, to start a business. I think Brian and I were both too busy seeking our fortunes in those days to properly keep up with our social lives. We named our son after Brian who was born about 13 years after we lost contact with Brian. He was my best man at my wedding. My wife and I loved him to pieces. He and I never had a single argument or disagreement. 13. What compelled you to do the jump at Bridge Day in 2005? a) The equipment was just like stepping into the future. I was real eager to experience the evolved state-of-the-art parachute technology after about 34 years. I had never jumped a square. b) Even with only two B.A.S.E. jumps under my belt, the BD ’05 jump gave me the distinction of having been a B.A.S.E jumper longer than anyone on the planet. For the record I plan to make my next one in the year 2045, just to keep current. 14. The Los Angeles Times reported that Jean Boenish had advised Brian to not jump at Bridge Day 2006 and that he ignored her warnings. Did you have any concern for Brian jumping having not been active in the sport and receiving limited training? I did have some concerns. It seemed that Brian was able to handle only small portions of training at a time, but he was trained by the best. He seemed to forget some of the important things very quickly. He was not the same old Brian I knew when we were young. My concern was that he may have a malfunction he might not be able to remember how to handle correctly, or that he may end up in a tree somewhere, or heaven forbid, break a leg. Brian had two bachelor’s degrees and a master’s. He definitely knew how to count to two and throw. I watched him simulate it at least twenty times. Never in a million years did I dream that he would go all the way in with his pilot chute in his hand. 15. In your wildest dreams back in Michigan flying your Benson gyrocopter and having your first taste of skydiving, did you ever imagine yourself jumping from a cliff? I must admit that the thought never occurred to me. Bonus Questions: 1. What has been your experience in meeting people from the sport either through the forums or at the events? I have met so many terrific and some not-so-terrific people through the B.A.S.E jumper forums. I wouldn’t mind saying a few words about the terrific ones, except for the size it would add to the interview. My wife, daughter and I had dinner last night with Nick Di Giovanni and his lovely girlfriend, Dr. Julia Bell. We have become great friends with them over the past few years. Johnny Utah and Tom Aiello have bent over backwards to make me feel a part of the history of B.A.S.E jumping, along with others too numerous to name. Marah Strauch has been an absolute doll. She actually flew to California from New York to go to a party at Tina’s house before Brian left us, and again to attend Brian’s Memorial Services. 2. Some jumpers don’t consider making 1 or 2 B.A.S.E. jumps as qualifying a person to be a B.A.S.E. jumper. What do you say to those individuals? I agree with them. I may have wet the bed when I was two years old but wouldn’t call myself a bed-wetter. I also have made one bungee jump and wouldn’t call myself a bungee jumper. I only refer to myself being a B.A.S.E jumper in jest. I took Johnny Utah’s course like any other first jump student to prepare for my jump at BD ’05 after a nearly 40-year respite. I began my speech at the ’05 awards ceremony saying: “This is the part where you listen to two old guys, one with one B.A.S.E jump, and the other with two, telling you experts what B.A.S.E jumping is all about”. All rights reserved. No republication of this material, in any form or medium, is permitted without express permission of the author. This entry was posted in BASE Jumping and tagged 1st BASE jump, BASE, Mike Pelkey. Bookmark the permalink.